Everything happens for a reason and at right time. Though I was getting little impatient with no personal holiday this year, the first one in 2018 came only in the month of November. Strange for a travel lover like me but things happen and they do for a reason. The best part about the trip was meeting my college buddy after 9 long years and visiting the place I had been wanting to visit from more than 10 years. 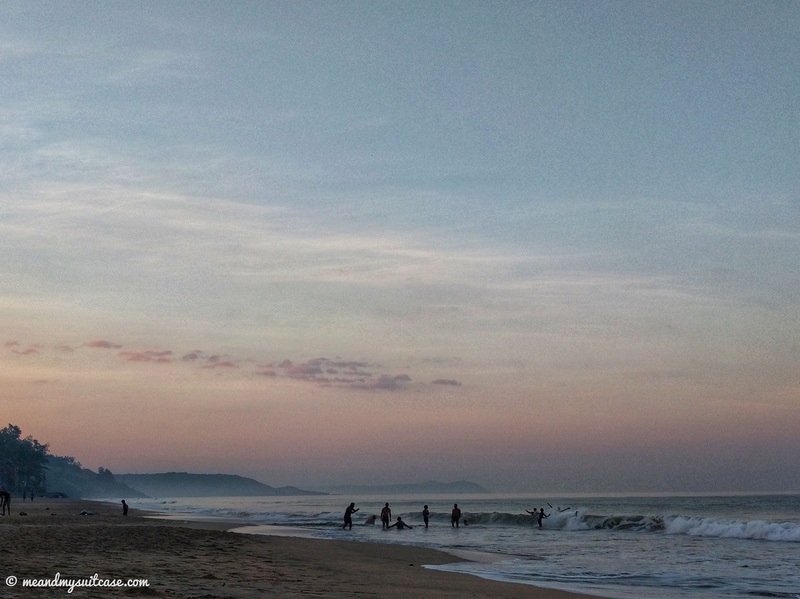 I got up very early because I wanted to see the effect of sunrise on the beach. Hopped out of my bed, freshened up and left for the beach in my pajamas. There is a way to beach from the resort as well and it was right next to my room. The cool sand was very welcoming to my bare feet, the pristine water had a perfect green color at this time with a tint of pink and purple, very soothing to my eyes and mind. 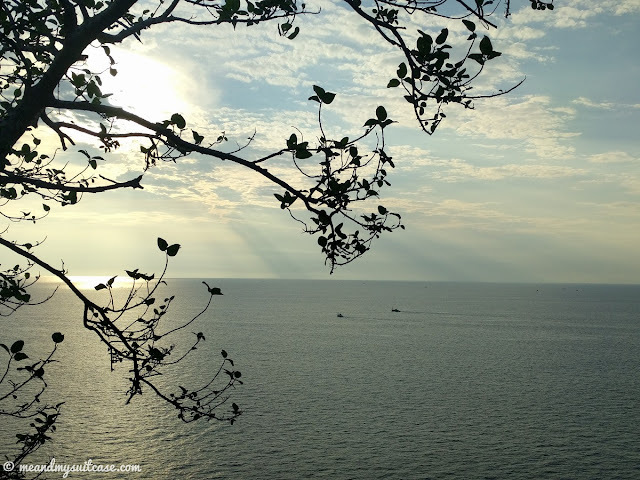 The sound of waves and chirping birds on meeting with the windy morning created a great musical memory for me as I sat a little away from where the waves were crashing in, gazing at the sea trying to find answers to the mystery i.e. "horizon". 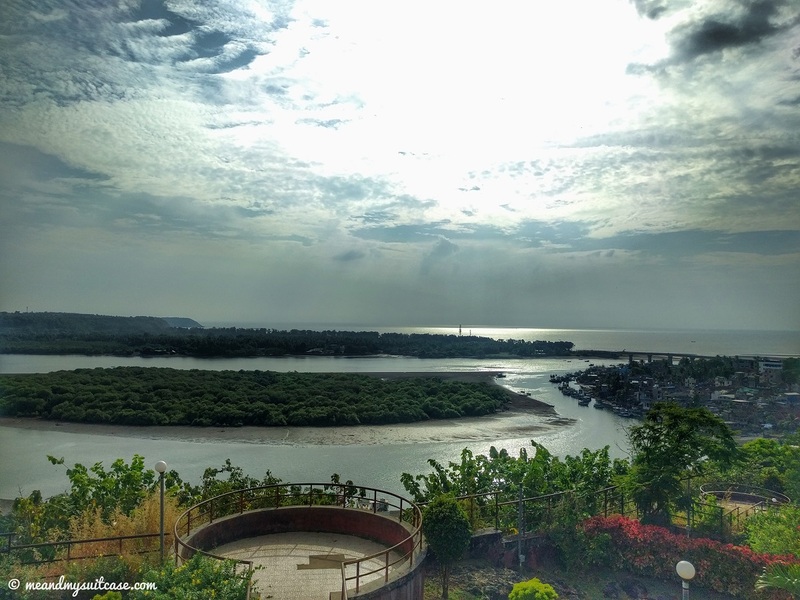 Soon after our breakfast at Tarang we called Amit (the auto guy who took us around Jaigad on Day 2), checked out from MTDC Resort, Ganpatipule and left back for Ratnagiri through the scenic road overlooking the coast. 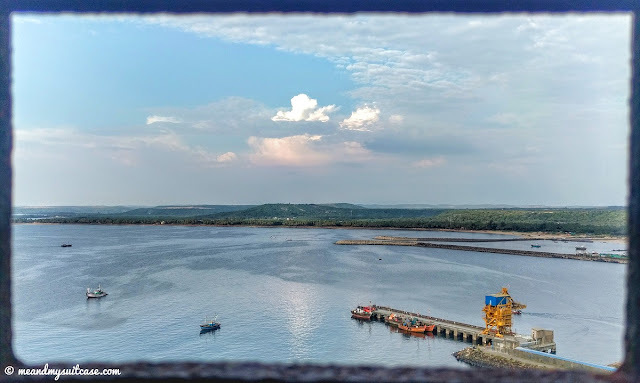 We reached Ratnagiri, the port city in less than an hour and checked in Hotel Swaroop which is quite reasonable and in central part of the city. 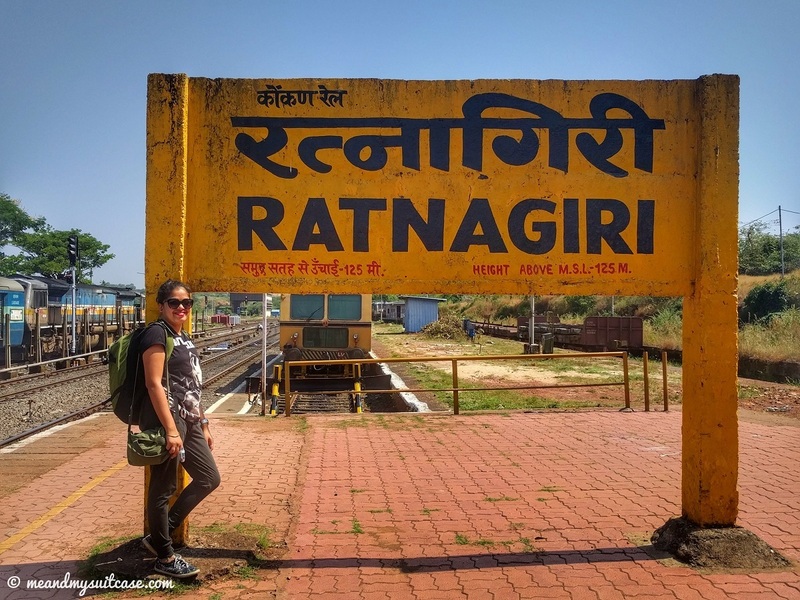 Ratnagiri is a simple and humble city so don't expect big restaurants or malls, the former are in plenty but basic lunch home kind. There are some famous restaurants but they are in the new part of the city. Post lunch we waited for sun to cool down a little and then booked an auto to take us around (Pravin, our driver was very humble and patient soul and we were lucky to get amazing people to take us around on our trip in Ganpatipule and Ratnagiri). 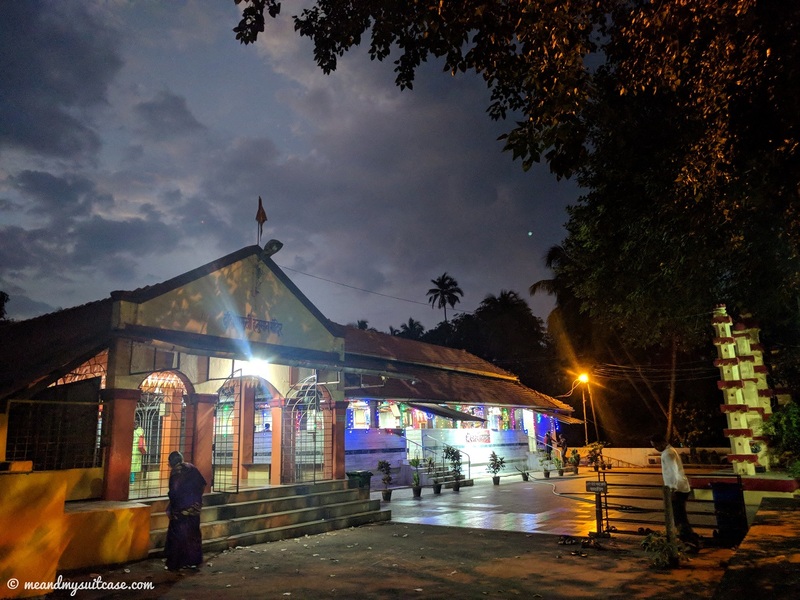 Places we covered on Day 3 were Lighthouse (luckily I got to climb up inside), Bhageshwar mandir, Ratnadurg Fort, Kadalot point and Kal Bhairav temple. We did some research and as our hotel guy informed that there are timings to visit lighthouse, I thought that's it, I am going inside. This was my moment, moment to finally see how lighthouse looked from inside. The road to lighthouse was a lot bumpy and we kept going up and up through the cover of trees, a lot of trees. That's happiness. Set on a higher terrain, it was a clear sight with no real estate except the set up of lighthouse. We bought our tickets (Rs. 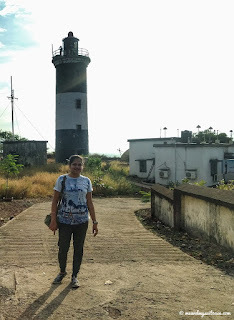 20 per person including camera charges) and the caretaker took us up the lighthouse. 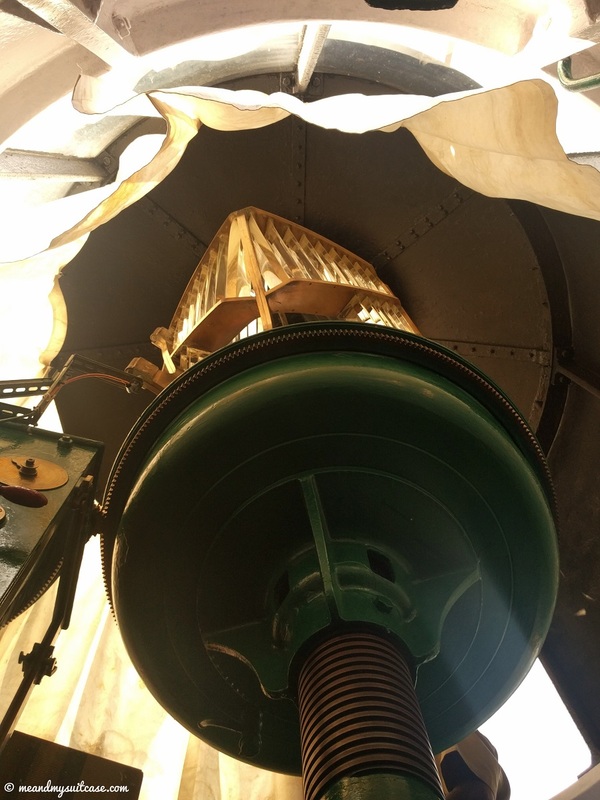 After climbing 4 stories on circular staircase, I witnessed the 'glass & brass' beauty that emit light, a huge fascinating lamp. It was an exciting moment for me and my face was lit with glee probably matching the illuminance which this lamp was designed for. As the guy was explaining us about the lamp (this one has a 50 km range), my mind started wandering the lane of physics classes back in school days. 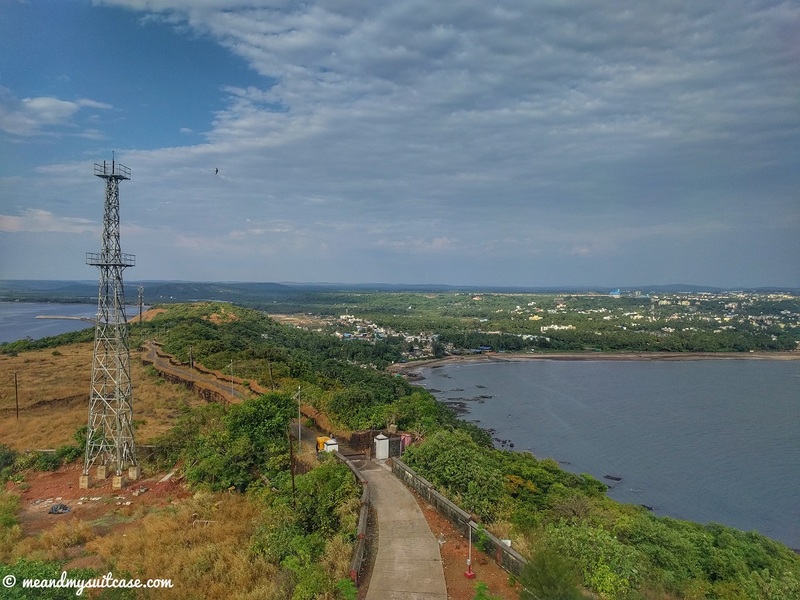 The top of lighthouse offers an incredible 360 deg view; vast sea, the fort, solar panel set up and a beautiful & almost complete city view. I loved it here. On our way to the Ratnadurg fort we spotted this temple. It is maintained by a trust and is in a peaceful setting. I loved the interior specially, very well constructed specially the column structure. Ratnadurg fort also known as Ratnagiri fort and Bhagwati fort, is the main tourist attraction for the the Bhagwati temple inside. It is surrounded by sea on three sides and has a temple, well and pond inside. As you walk through the inner periphery of the fort you will be amazed with the view it offers. Built during the Bahamani period, it was won by Shivaji Maharaj in 17th century from Bijapur's Adil Shah but was later won by British in 1818. 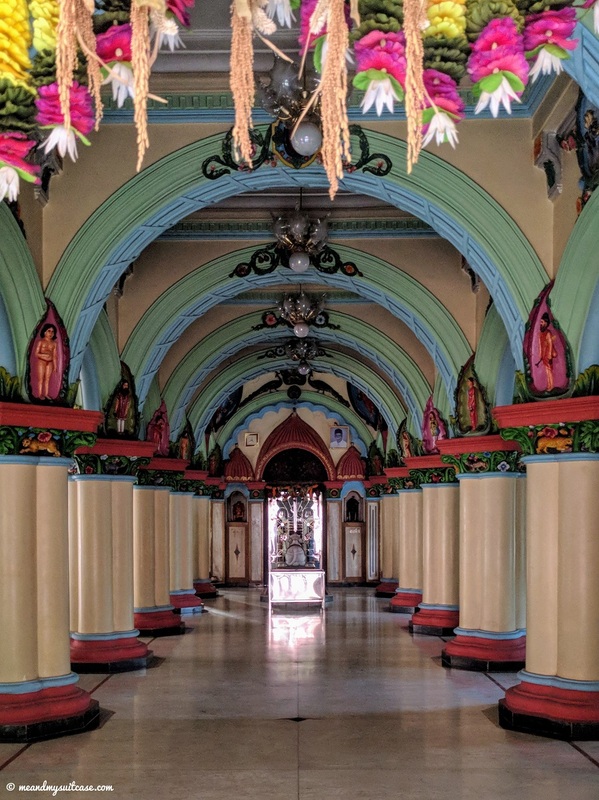 Now in India, it was renovated in 1950. 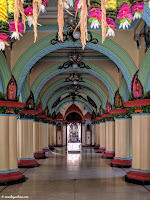 Its entrance is very colourful so is the temple. There is a word of caution written at the entrance that a siren / bell will ring at 1800 hrs and any one inside has to leave the premise because after the warning bell the gates are closed and no one can come and go inside the fort post that. Can you spot the Lighthouse? 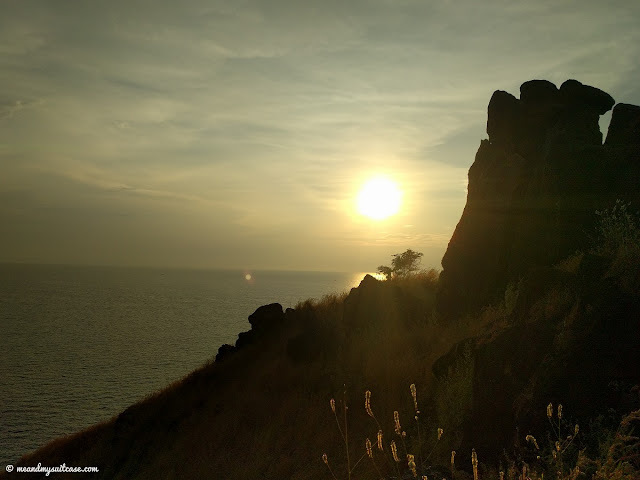 It is the famous or say infamous point in Ratnagiri, the Marathi word "kadelot" means throwing off the cliff, which was the punishment for those who betrayed the king or kingdom in olden times. The view from Kadelot point is jaw dropping. It is a steep yet fascinating hike through the meadow. The rocks on top and meadow covering the area make for a picturesque scene that you would love to get framed on your wall. The boats dancing on Arabian sea and waves crashing the rocks & cave makes everything look very filmy, some times dangerous and so mysterious. But in the end it's the kind of place where you can find solace. 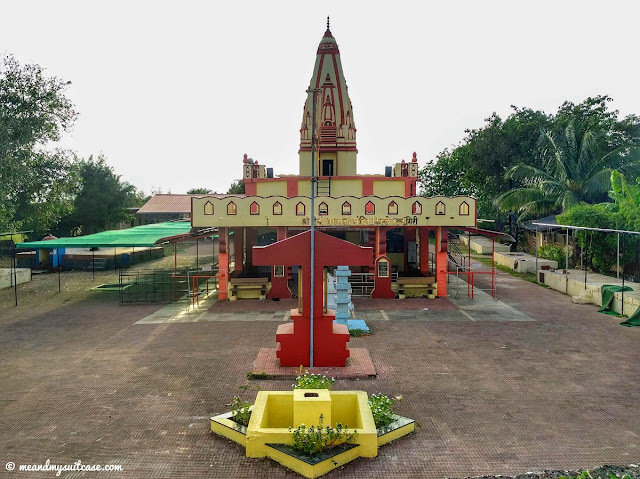 It's a beautiful temple, with dakshin mukhi hanuman at the entrance on left and then kal bhairav temple on right. 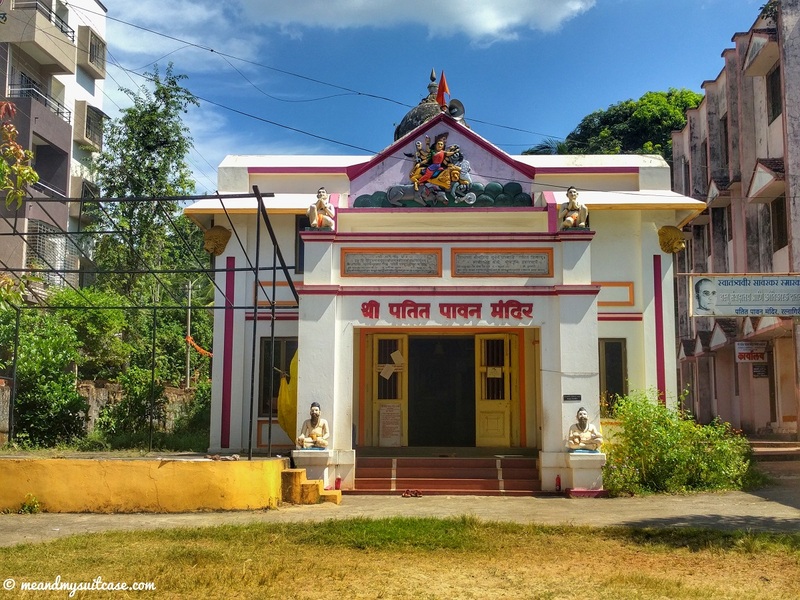 When you take the small door from the kal bhairav temple side you will find many small temples dedicated to many god and goddesses. By the time we had reached here the sun had already set and the clouds were some how in our favour and played beautiful notes with the sky and the lights which I could capture at the right moment. After a heavy breakfast we left on foot to explore near by places with bags packed and on our backs. Ratnagiri is the birth city of independence activist, Bal Gangadhar Tilak, born on 23 July 1856, who was also a teacher, lawyer and Indian nationalist. 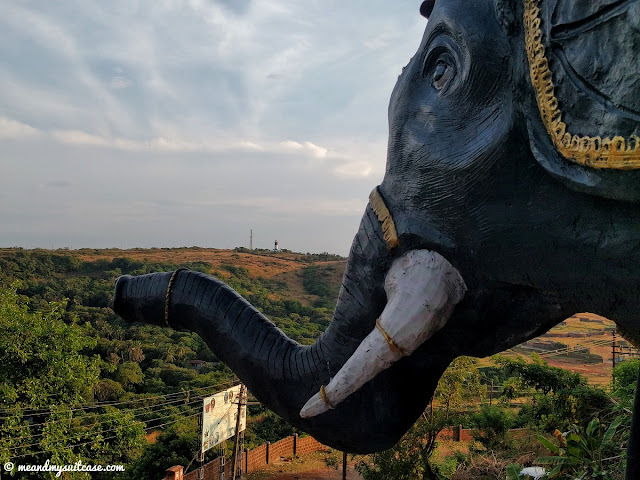 This smarak is where he was born and it is an inspiring place indeed. Very minimalistic, the house now converted in to museum has his basic personal things, some letters, newspaper cuttings and many pictures. I loved the place, it had an astounding aura and a lot of information on Tilak ji. I urge everyone to visit here when in Ratnagiri. It takes you back in time, remember history lessons? Dedicated to Sita and Ram, Patitpavan is a beautiful temple on the main road while Ganpati temple is a little ahead in a gali. Latter is covered with trees and is a very cool and peaceful site. After this we had our lunch at Amantaran, a famous restaurant in Ratnagiri and then headed to Thibaw Palace which I was really looking forward to visit. 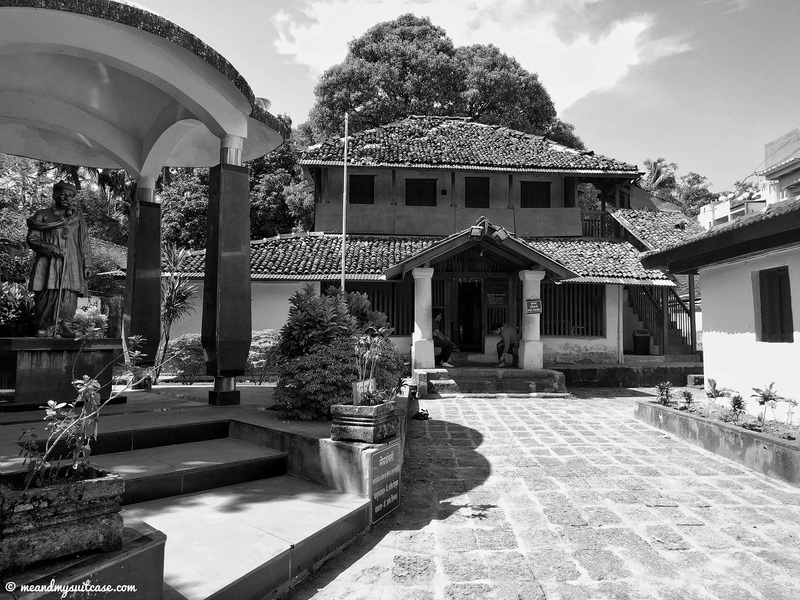 Thibaw or Thiba Palace was the place of residence of Brahmadesha's (today's Myanmar) king, Thiba. He was the last king of Brahmadesha and ruled it for 7 years (till he was 26 yrs old) before he was brought and detained in Ratnagiri by the Britishers after they overtook the ruling of his entire region. This 3 storied Palace was built for the king and he was kept here to make sure that he don't rebel against Britishers. Constructed in Brahmi style on a remote land back then, it's here the king took his last breath at the age of 58. 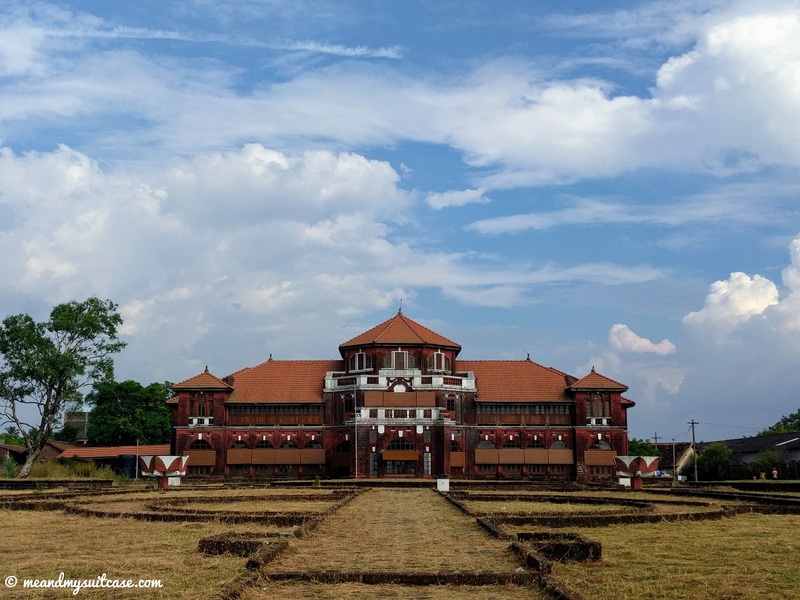 This beautiful palace is constructed on a 27 acre land which I would say is kind of barren and not very well maintained but the palace building is in good shape, specially the windows and doors which are beautifully carved and are the main attraction of the palace according to me. The palace also houses many artifacts and personal items of King Thibaw. It is an architectural site and entry fee is mere Rs.5. I hope the government take some care of this interesting place before it turns in to ruins. Look for the sun direction and its light which when come inside the palace through the beautiful windows, make it perfect for photography. Very near to the palace is Thiba Point which is a nice place to hang out and has a pretty good view overlooking Bhatye Bridge, Arabiam sea and Someshwar Creek on one side and old Ratnagiri city on the other. This was the last spot of our 4 days mini holiday and I loved every bit of it. Hope you visit it some time and if you have already been here, don't forget to share your favorite spot in the comment section. I loved Kadelot point the most in Ratnagiri, Karhateshwar temple in Jaigad and Ganpatipule beach in Ganpatipule. "Trip was awesome, away from crowd and I am really glad to catch up with you (Stuti) after 9 long years. I loved every bit of the trip but my favorites are Jaigad fort and Karhateshwar temple". P.S. All pictures are taken by me unless and otherwise mentioned. More pictures coming soon on my instagram page as I start #destinationseries. Click here for more: www.instagram.com/junkkdna. Splendid views is what you got from every place you visited in these two days. The experience of going up the lighthouse would have been so amazing. Yes I did. It was so awesome to be able to do all those things. I was completed bowled over the last picture that you shared. What a wonderful place.. I sometimes wonder if I would ever be able to cover all these places in one lifetime or not. Very well documented. Thank you debjani. You will, we all will ... Amen! Well I went on a weekday, so less tourists 😉 But yeah some places need promotion. 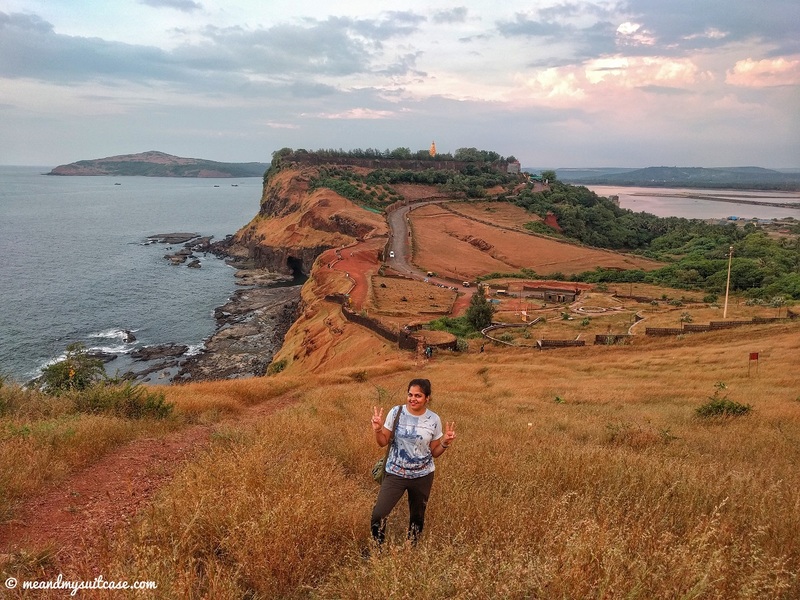 Ganpatipule is known but ratnagiri is not much a touristy place, it's more of what you can really explore. When I was researching on these places, I came across one cave in ratnagiri, unfortunately even locals were not much aware about how one can explore it, so I had to skip it but did click it's pic from top of kadalot point (ratnagiri). The cave looked something like in national treasure movie (mt Rushmore part). Ah! 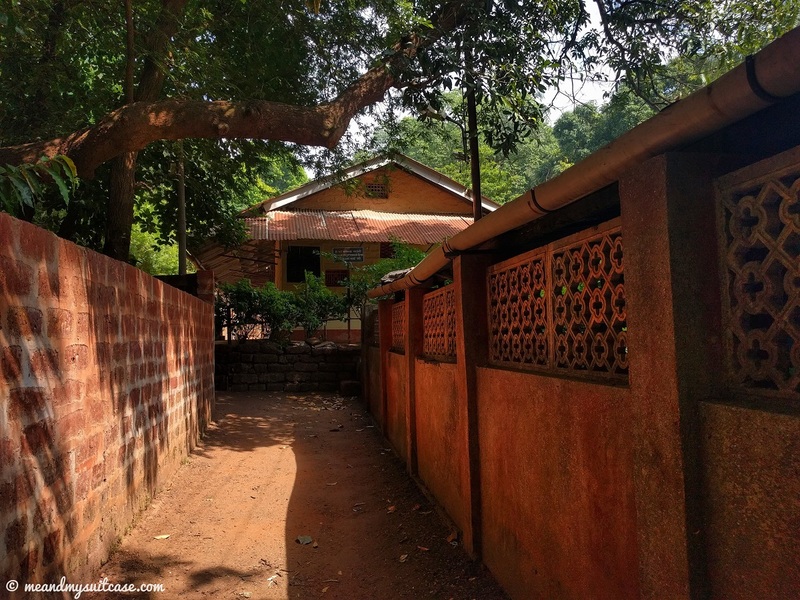 the post reminded me of my visit to Ratnagiri. It is such a beautiful place. And I am so glad that you could climb the lighthouse. My luck with lighthouses is so bad! I remember visiting the Thiba Palace. Even at that time (2011), it was in poor condition and not well maintained. Looks like a great trip. How was the food at the MTDC?